Summary: Difference Between Cookies and Sessions is that E-commerce and other Web applications often rely on cookies to identify users. A cookie is a small text file that a Web server stores on your computer. Cookie files typically contain data about you, such as your user name or viewing preferences. While You can describe Session as a server-side storage of information that stores information of the user’s interaction with the website or web application. Unlike Cookies, Sessions stored on the server side. Online shopping sites generally use a session cookie to keep track of items in a user’s shopping cart. This way, users can start an order during one Web session and finish it on another day in another session. Session cookies usually expire after a certain time, such as a week or a month. You can set a browser to accept cookies automatically, prompt you if you want to accept a cookie, or disable cookie use altogether. Keep in mind if you disable cookie use, you will not be able to use many of the e-commerce Web sites. You can describe Session as a server-side storage of information that stores information of the user’s interaction with the website or web application. 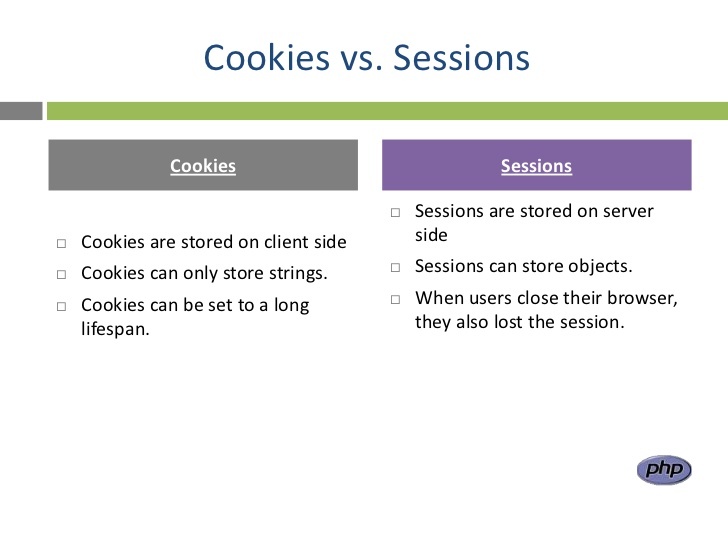 Unlike Cookies, Sessions stored on the server side. While a large information which is constantly changing on the user’s side is hard to store in user’s browser, only a unique identifier is stored on the Client Side (Session ID). This session id is being sent to the server by user every time you makes an HTTP request. Sessions can’t just only store Strings, they can also store objects. But in sessions, after closing the browser user also lose their session id.